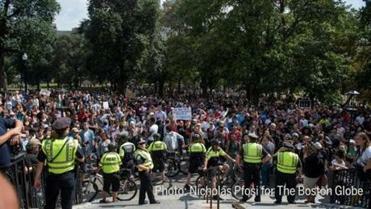 Four men with weapons were among 33 arrested by Boston police during Saturday’s “Boston Free Speech” rally and counterprotest on Boston Common, police said Sunday. The bulk of the charges included disturbing a public assembly, disorderly conduct, and resisting arrest, according to a list of arrests police posted to their website Sunday. Arraignments are scheduled to begin Monday morning at Boston Municipal Court, and will be spread out over Tuesday and Wednesday, according to Suffolk District Attorney spokesman Jake Wark. Among them was Nathan Mizrahi, 38, of Norwich, N.Y., who was arrested and charged with unlawful possession of a firearm and ammunition, police said. Police said two men -- Roberto Bonila, 20, of Chelsea, and Shaun Petty, 33, of Taunton -- were each found with a knife, and charged with assault and battery by means of a dangerous weapon. Petty was also charged with assault and battery on a police officer and resisting arrest, police said. Shawn Vieira, 25, of Boston, was also found with a knife and charged with unlawfully carrying a dangerous weapon, as well as disturbing the peace, police said. The youngest person arrested was a 15-year-old from Cambridge, who police said was charged with two counts of assault and battery with a dangerous weapon and disorderly conduct. Four men from out of state, including Mizrahi, were among those arrested. A 36-year-old man from Vermont and a 25-year-old man from Eugene, Ore., were each charged with disturbing a public assembly, resisting arrest, and disorderly conduct, police said. And a 46-year-old from Miami, Fla., was charged with drinking alcohol in public, police said. “Thankfully, the majority of those attending did just that. Unfortunately, not everybody understood the importance of good behavior,” the statement said.